How are we using our grant? Gymnastics, swimming, water safety skills, dance, football, tag rugby, basketball, uni-hoc, scoreball, rounders, athletics, golf, OAA, goalball, tennis, athletics, cheerleading, skipping, quick sticks hockey, team building skills, netball, dodgeball and multi skill sessions. 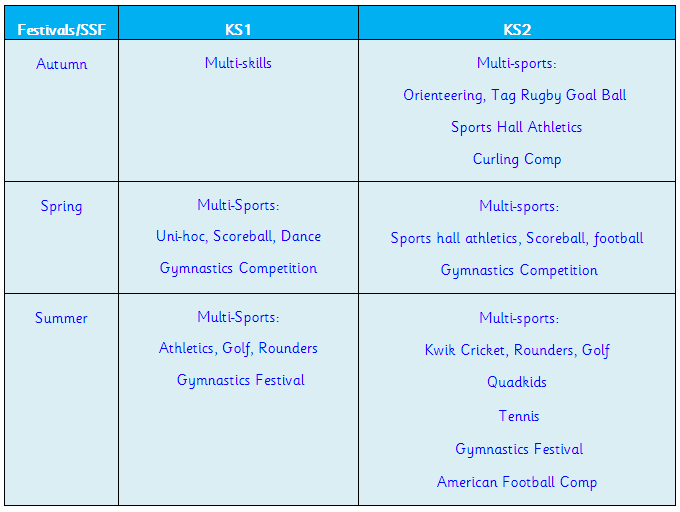 All pupils in KS1 have had the opportunity to take part in a variety of sports festivals over the year as well as develop their skills in their own outside areas. Year 1 also helped out with Year 5 when they were training as Sports Leaders this term. 100% of children from Years 3 to 5 will be offered the opportunity to take part in After-School and/or Lunchtime Sports clubs. Years 1-2 clubs to be looked into and costed up. 100% of children from Reception to Year 5 will have the opportunity to participate in swimming sessions in the Autumn and Summer term. The effect of funding has been that the awareness of sports and healthy lifestyle in school has risen. 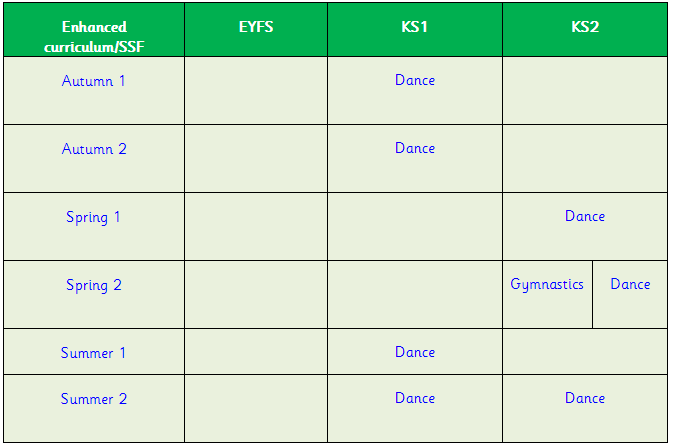 Pupils have been exposed to lots of variety within PE. This has also raised their interest and attainment within the subject. An example of this is that during the Autumn Term, a group of Year 5 pupils took part in a Yr5/6 Dodgeball club and competition against other schools and came 4th. Future PE subject leaders will follow up this years hard work and improvement by organising more staff curriculum development, clubs for all year groups, increased participation in intra and inter school competition as well as developing as sports leadership program from yrs 3-6 to allow KS2 to assist KS1 during sports day etc. Swimming Training for new teachers/refresher training. Goal Posts for curriculum, after school clubs and Inter-School Competitions. All transport costs are included in this. Gymnastics, swimming, water safety skills, dance, football, tag rugby, basketball, uni-hoc, scoreball, rounders, athletics, golf, OAA, goalball, tennis, quadkids athletics, cheerleading, skipping, quick sticks hockey, team building skills and multi skill sessions. How has the grant made a difference to the PE and sport participation and attainment of the pupils who attract the funding? The measures we have taken to ensure sustainability have been to establish long-term associations with specialists who have worked alongside existing teaching staff to ensure that all teachers can now deliver high quality PE across a range of areas.